It was grotesque to see when the news showed a daughter gruesomely beating her mother. With old age comes insecurities, incapabilities, loneliness and ignorance. The second childhood is mere an oblivion sans teeth, sans eyes, sans taste, sans everything. India has 50 million elderly population, which is the tenth of the world's elderly population. It is saddening to see an increase in the number of old age homes and retirement facilities, which indicates a lack of understanding and congeniality among this generation and their parents. Reluctance, hesitance and a widening age gap are leaving our elders alone making their old age even more insipid. Living in a cosmopolitan city like Delhi is like running a never ending race and people are adopting the nuclear family culture. The elderly are left alone at homes and often find it difficult to mingle with the fast-paced world. Technology is one area where most of our grandparents lag. Through this drive, we the younger generation are doing all we can to get involved with the elder couples living alone. The funds raised will be used to plan an event in a colony where we will engage in interaction with the elders, play games with them, listen to their stories, teach them technology, enjoy with them, celebrate occasions with them, and make them feel included. This initiative will lead us to help them better. We will volunteer to help them complete their daily activities, like going to the market etc. The second childhood should also be nurtured well and that's what we are aiming for. Thank you for your love. All the funds have been donated to Janak Samaj Samiti, an elderly home in sector 19, Faridabad. The elderly home houses 45-50 elders from age groups 65-80. The home also holds vocational and tuition classes and for the underprivileged children. A heartfelt and a big to you for contributing towards this cause. 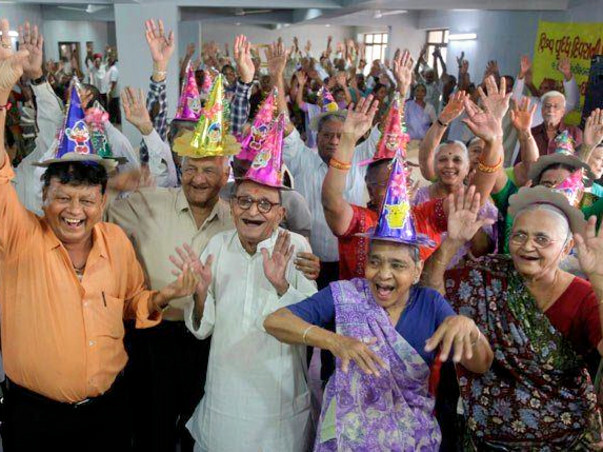 India has the largest population of elderly and we often neglect them. Some are fortunate enough to spend their 'second childhood' with their children and grand-kids, but some are left in oblivion to spent their time in old age homes, which often are in a dilapidated condition. We would be contributing most of the money to buy all the needed medicines, and bed linens and blankets for Guru Vishram Vridh Ashram, Mathura Road, Gautampuri Phase-I, Opp Mohan- Estate Metro Station, Badarpur, New Delhi, Delhi 110044. The amount will also be spent to conduct a get together of all the elderly with the children from an orphanage, which will be decided soon. We want to ensure the elders receive the warmth and love, this festive season.